Light frost on the roofs and receding snow. That first hint of green in the landscape. Hunting for the first wildflowers. Putting away the snowshoes and skis and dusting off the hiking boots and bear spray. Life and hope spring anew this time of year. There is a a palpable energy in the air. A buzz. I can practically taste it. For me, this is the new year. And who knows what it will bring? Now that is exciting. This past weekend, that meant the first backpacking trip: destination Yellowstone. Sometimes you just have to get out, and that is what my buddy and I were determined to do. Saturday afternoon it was pouring as we left the ranch. In the Park, it turned to snow. Soldier on. We parked at the trailhead with just enough daylight to hike the six miles to our campsite. 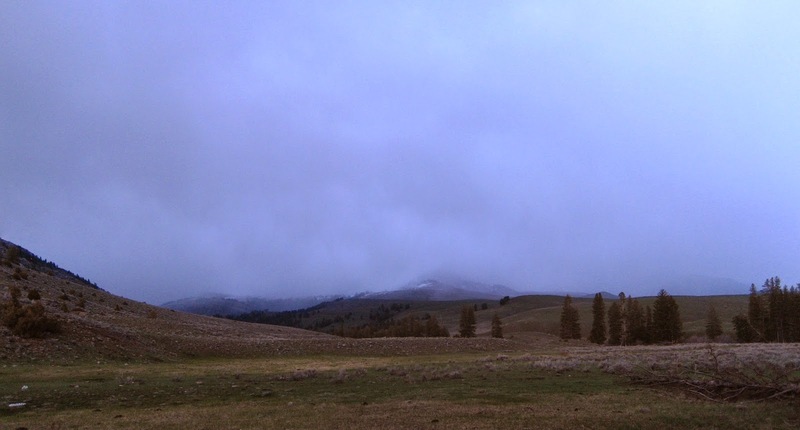 We shouldered our packs and with a thunderclap the snow abruptly stopped. After a quick dinner and setting up camp, in the receding light we saw the snow creeping down the hills toward us as we climbed into the tent. Perfect timing. The next morning we awoke to sunshine and a brilliant blue sky. Instead of the snow, wind, and rain we had mentally and physically prepared ourselves for, we worried about getting sunburned. I would like to think the optimism of spring somehow factored into the equation. We ate breakfast with the bison. They agreed that our campsite was par excellence. In search of adventure, we set off for a day hike from our camp, ambling through meadows and over rolling hills. Along the way, we passed herds of bison, elk, and pronghorn. Swallows darted through the air catching insects above the water. Tenacious sagebrush buttercups, shooting stars, and pasque flowers dotted the just-thawed ground. Fresh snowmelt thundered down the river. Well of course we decided to go for it-let's head to Gardiner! We formulated a plan to hike in, grab some lunch, and then hitch hike back to Hellroaring where we would hike the 6 miles to our campsite. The one problem was our lack of money-we had left our wallets in the car since the old greenback does not do you any good in the backcountry. You buy your safety by carrying bear spray, and the sights are free. Hmmm. We decided to try and buy pizza on a promise, and if we had to we could leave collateral in the form of a camera or other gear. In the end, we got our pizza and managed to get back to our campsite with an hour of daylight to spare after hitching three rides. The optimism of spring again? There is no guarantee for two guys with beards and muddy hiking clothes to hitch a ride in the scant spring tourist season. Even potential rides were not plentiful coming out of Mammoth Hot Springs at 4pm on a Sunday. Just like the seasons, we came full circle, and had a great time doing it. A solid 20 mile day of hiking put us right to sleep, with bison, elk, and all of the other majestic creatures of the Park roaming our dreams, the taste of adventure lingering on our lips and our spirits renewed by Mother Nature. Today, we felt alive.